Relaxed neutral backgrounds, a blending of natural materials and light wood tones serve to create an environment that is pleasing to the eye, and the soul. Monterey Sands finds its inspiration in understated West Coast style. Clean architectural lines lend a fresh look to the elegant simplicity of transitional design. 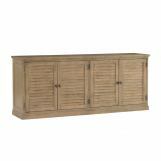 Crafted from Grey Elm veneer, pieces are gently wire-brushed to highlight the distinctive grain lines. The sandy brown Cambria finish is rubbed with an oyster white glaze, accentuating the character of the wood and offering a rich compliment to burnished bronze metal accents. 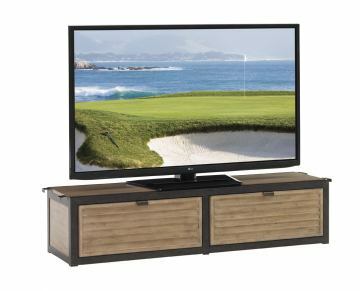 There is no denying the chic, contemporary feel this tv console has to offer your living room. 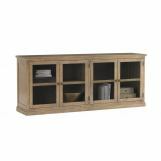 Introducing the Camino Real Drawer Box Console Unit, a piece that offers a simple design all while capturing the epitome of west-coast living. The low-profile drawer box features a burnished bronze metal frame accentuated by the louvered wood fronts of the two drawers. 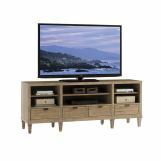 The contrasting metal and Cambria finish of the Grey Elm veneers makes for an attractive tv stand. Adding a final touch of class is a custom hardware piece. 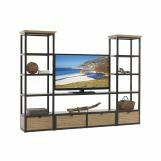 Pair with the Camino Real Drawer Media Towers for a complete wall entertainment unit.